Star Trek Into Darkness has never looked or sounded better than this new 4K UHD release, but it's hard to ignore that this is a big budget remake of Wrath of Khan. Star Trek Beyond (2016), the third installment in the Star Trek reboot series comes out in theaters soon. Paramount is cross-promoting the film with new re-releases of the other two films in the saga, Star Trek (2009) and Star Trek Into Darkness (2013) in glorious 4K Ultra HD editions. Those buying the new 4K Blu Ray discs will be twice as excited to see Star Trek Beyond and those excited about Star Trek Beyond are that much more likely to go out and buy the 4K Blu Rays. However, even as the price of Blu Ray has gone down, this new format carries quite a price tag. Buying both re-releases will cost you almost $100., Luckily each package contains three discs with the final being a treasure trove of bonus features from documentaries to gag reels to promotional material. However, much of this is retained from older releases, so the main draw for this expensive re-release is the film itself presented with never before seen or heard picture and sound in a home theater format. How is the film itself? Well, much of the “baggage” of the "Star Trek" name with the recast characters and alternate timeline was dealt with in the 2009 reboot film, and while there are still some lingering issues for longtime fans, there's still much to enjoy in Star Trek Into Darkness. The film is pretty spectacular, with enthralling action sequences and stellar special effects (when you can make them out through director J.J. Abrams’ omnipresent lens flares). The cast manages to be even better this time out, more comfortable in their skins (which used to belong to other actors) and very natural. While still set in an alternate timeline, more attention is paid here to the original saga to show that before the reality-altering time-travel event this was still the Star Trek that we knew and loved. In this second film, the stakes are higher. Almost immediately Star Trek Into Darkness remedies one of the biggest issues left in the wake of the first film, that being Cadet James T. Kirk (Chris Pine) being immediately promoted from trainee to Captain of the Federation’s flagship. After a botched assignment, Kirk is stripped of his command and sent back to Starfleet Academy because he is, as we already know, not ready yet. After a (somewhat heavy-handed and metaphorical) terrorist attack, however, Kirk, Spock (Zachary Quinto) and the perfectly cast Dr. McCoy (Karl Urban) are back on the Enterprise, chasing after the film’s main villain. If it was ever a spoiler to reveal that this villain is actually the original saga’s “Khan”, that time has passed (the 4K release prints this fact right there on the box). However, it was a surprise to many to see that Khan, a Sikh superman, as established in the original series, is now played by lily white Englishman Benedict Cumberbatch. While Cumberbatch is a capable actor who gives an appropriately menacing performance as Khan Noonien Singh, it’s hard to ignore the fact that this Indian character (originally brought to life by Ricardo Montalban), is being played by a lily white Englishman. They even give him a white guy’s name as a disguise: John Harrison. Along the way we get our first looks at the rebooted Klingons, a few huge surprises and a very exciting plot. While logic and mystery do often take a back seat to the more popcorn-oriented commercial elements that Paramount demanded for the new series, the cast and crew do take more pains to hew closer to the original formula here and action never quite takes the place of thought. However, once the cat is officially out of the bag that this is a retelling of the story of Khan, the film quickly morphs into a virtual remake of Star Trek II: The Wrath of Khan (1982). From that point forward the film becomes predictable and the plot becomes less a case of “what will happen” and more a question of how the same things will happen and to which largely interchangeable character. To an extent, this is the exact approach Abrams would employ two years later at the helm of Star Wars: The Force Awakens (2015) which, if you search your feelings, Luke, is very much a remake of Star Wars (1977). However, like Star Wars: The Force Awakens, Star Trek Into Darkness manages to rise above its derivative elements to become a pretty damned good movie and a hell of a lot of fun, to boot. 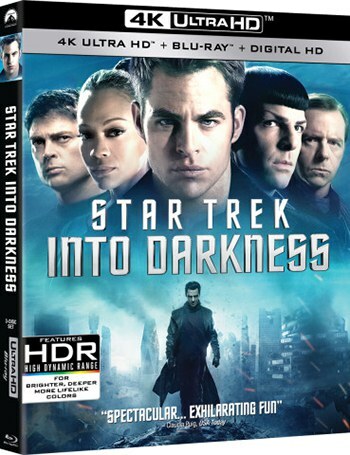 With the 4K Ultra HD treatment Star Trek Into Darkness has never looked or sounded better and with the extras included here, you’ve got one of the very best Star Trek packages ever released; the film and the extras are high quality and the disc collection is excellent. However the price tag of almost $50 would give even staunch collectors pause.